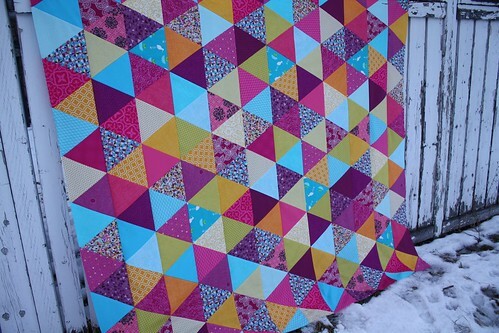 A started this quilt back in September and am a bit ashamed of how long it's been sitting around on my design wall. Last month in my desperate need to finish this baby I even polled the audience for arrangement suggestions. In the end it was pretty much a 50/50 split so I decided to push myself out of my comfort zone with this one by simply doing a random arrangement. I couldn't help myself though when I decided my eye needed a place to land in all the randomness, so I added a subtle purple hexagon. 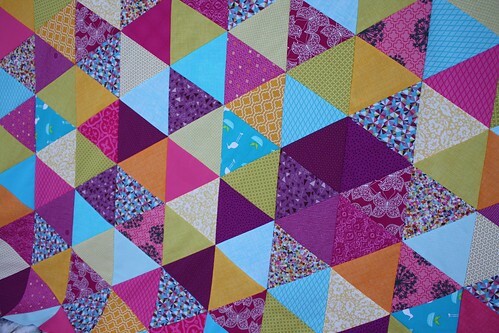 The hexagon on its own isn't very easy to spot but I'm hoping that if I quilt it differently than the rest of the quilt, it will really make it pop. I'm typing this out with very sore shoulders. 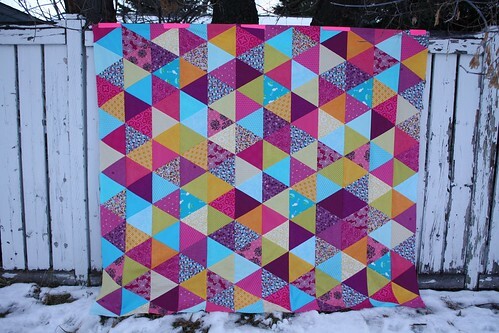 I was able to quilt 1/3 of it yesterday and I'm back at it again today. Swirly swirly swirly. 4 days left until Christmas! Tell me I'm not the only one with unrealistic finishing goals this holiday season! p.s. 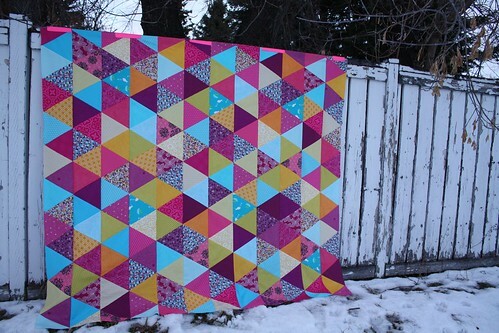 If you're wondering why I have prenamed this quilt my Mermaid Triangle Quilt, just wait until you see the back *eek! It's stunning Kelsey! Take it easy with the quilting - I've overdone it before and it took several weeks for my neck and shoulders to go back to normal :-( Can't wait to see the back! And you KNOW I'm right there on the unrealistic goals boat with you! You've SO got this, though! :D I did way way way simpler quilting than you on my dragon quilt (10" rated batting FOR THE WIN) and am almost to the binding step. It may actually get done after all!! I'm excited to see the back of this! 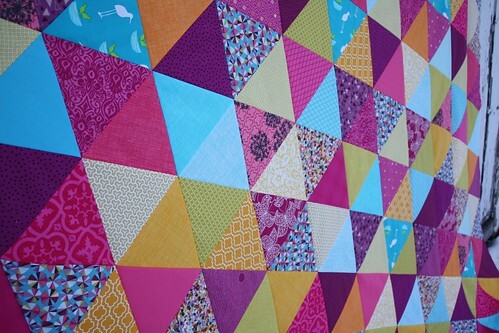 The triangles are so gorgeous, I absolutely adore the colors you chose. (it's totally radiant orchid! ;) Sooooo pretty!! These colors are gorgeous! I too struggle with the "random". So hard not to control it all! Thank goodness for design walls. Organized random. This is gorgeous. I like the purple hexie too. Can't wait to see it once you've finished it...and I'm dying to see the mermaid backing!! It looks gorgeous, and I love the colours! When you said hexagon, I thought, what? they're triangles! Once I saw the purple one, though, it popped out at me like an optical illusion! It is lovely! I love the random arrangement, and the colour palette. So great. Hope you had a wonderful Christmas!